here are a total of five LDS Temples in Arizona (2016). 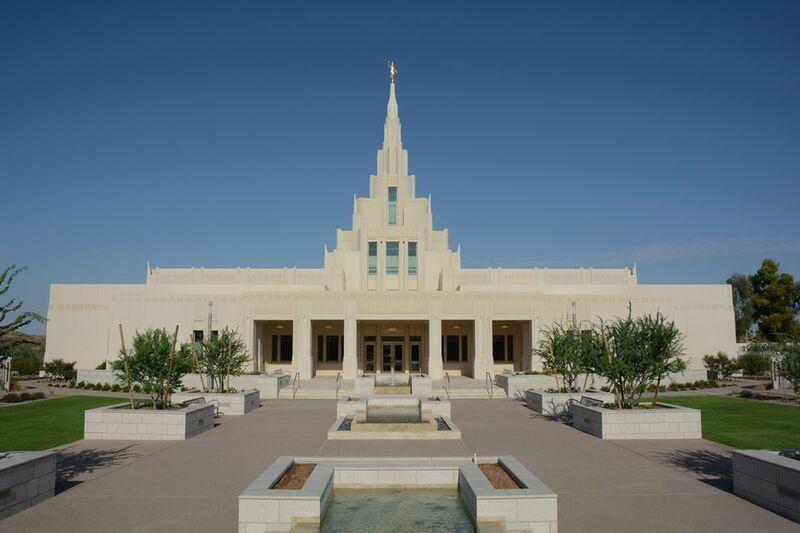 The other two Temples are located in Snowflake, Arizona, northeast of Phoenix near Show Low and in Gila Valley, Arizona, southeast of Phoenix near Safford. A sixth Temple in Tucson is scheduled to open in late 2017. Once you get close to a LDS Temple, they are easy to spot -- look for the tall spire! The Mesa Temple is the only one in the Phoenix area that has a visitor center. It is located in the East Valley. Take I-17 South to I-10 East and then to the 202 Loop East. Exit at Country Club. Go south (right) to Main Street and turn left onto Main. Just past Mesa Drive, the Mesa Arizona Temple is on the south side of the street. Take US 60 towards Mesa. Exit at Mesa Drive and turn north (if coming from the west, make a left; if coming from the east, make a right) to Main Street and turn right. The Mesa Arizona Temple is on the south side of the street. 101 Loop to the 202 Loop East. Exit at Country Club. Go south (right) to Main Street and just past Mesa Drive. The Mesa Arizona Temple is on the south side of the street. The Mesa Temple is also accessible by Valley Metro Rail. Just take the Light Rail to the end of the line in Mesa, the Mesa Drive and Main Street Station. That's about two blocks from the temple. Driving times and distances to Mesa from other Arizona cities. Gilbert is also considered part of the East Valley. From the west and north (Phoenix, Scottsdale): Take the Loop 202 Santan Freeway to Exit 41, Santan Village Parkway. Turn right onto Santan Village Parkway which becomes Greenfield Road. From the east: Take the Loop 202 San Freeway to Exit 38, Higley Road. Left (south) on Higley Road to Pecos. The Temple is at the intersection of Pecos and Greenfield. Driving times and distances to Gilbert from other Arizona cities. This Temple is in the West Valley, in Northwest Phoenix. Take I-17 to Exit 217, Pinnacle Peak Road. Turn west onto Pinnacle Peak Road to 51st Avenue.